Beautiful time softened palette of primarily blush/rose/pink, old cream and olive. 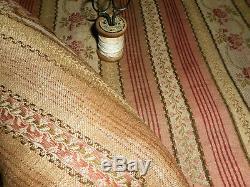 This is a cotton and linen of it's period and is about furnishings weight so mid density. The patina has aged and softened perfectly which gives it a fabulous faded grandeur look and appeal in projects. 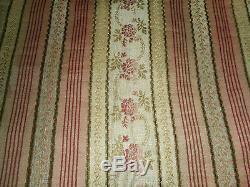 Lovely old textile used for an abundance of home pieces, pillows, lamps, decorative upholstery as well as creative clothing elements, bags/reticules and such. It is in good, strong overall condition for it's age. Used in it's former life with beautiful old variance/softening in the tones. Again slightly more aged as I have not laundered it. Perfect for the designer or artisan who desires this authentic old French appeal in their projects. 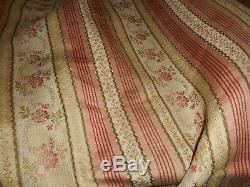 I sell antique and vintage fabric. 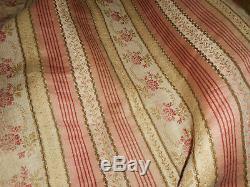 Each textile is different; some possibly used, some unused. I will give you my best assessment. I do not always launder them nor do I know all their history, how they have been stored over time etc.. I have a 30+ year long & extensive knowledge of textiles and gauge age ranges; fiber content etc.. To the best of my ability. As always please view all photos, dimensions etc.. As they are part of the description. Please keep in mind that I provide the best photos possible but monitors do vary. If my eyes should miss a small flaw, please know it is not intentional. Combined invoices are rarely accurate. Again, if you have any questions, please message me. 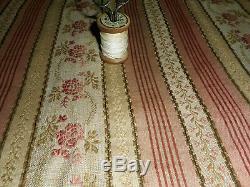 The item "RSVD Antique French Blush Rose Floral Lisere Brocade Fabric Faded Grandeur" is in sale since Thursday, January 31, 2019. 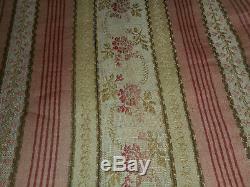 This item is in the category "Antiques\Linens & Textiles (Pre-1930)\Fabric\Cotton". The seller is "pia_threads" and is located in Columbus, Ohio. This item can be shipped worldwide.